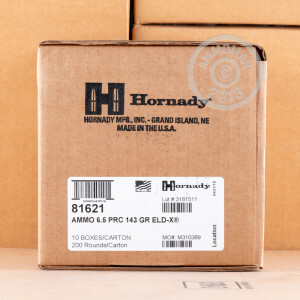 Hornady provides this 6.5 PRC round from their Precision Hunter ammunition line, and as the caliber’s creator they’ve spared no effort giving it pervasive quality. 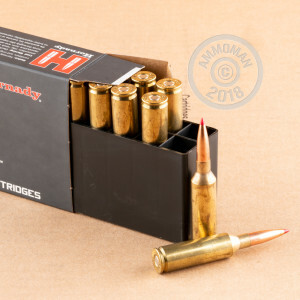 Its meticulously crafted brass casing seats its bullet as flat as can be, and its propellant charge ensures an undeviating 2,960 fps muzzle velocity so that each shot delivers the same flat trajectory and pinpoint accuracy. 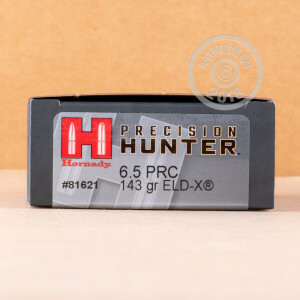 This cartridge sports a 143 grain ELD-X projectile. An all-range bullet, the ELD-X utilizes its thick jacket shank and InterLock ring to promote up to 60 percent weight retention at impact under 400 yards, and its polymer tip commences rapid expansion with up to 90 percent weight retention at greater distances. The ELD-X owes a great deal of its accuracy to the immutable meplat provided by its Heat Shield tip, as well as its ballistically efficient secant ogive profile and tapered base. Its AMP jacket’s superior concentricity not only promotes even and devastating expansion, but further ensures that the ELD-X won’t spin out en route to its destination.